Note: This plugin hasn’t been updated since last 3 years. I would NOT recommend this plugin anymore 🙁 . Yesterday I installed Better WordPress Minify plugin on my WordPress blog and Google PageSpeed Score increased from 84 to 93 immediately after activating this. Allows you to minify your CSS and JS files for faster page loading for visitors. This plugin uses the PHP library Minify and relies on WordPress’s enqueueing system rather than the output buffer (will not break your website in most cases). This plugin is very customizable and easy to use. 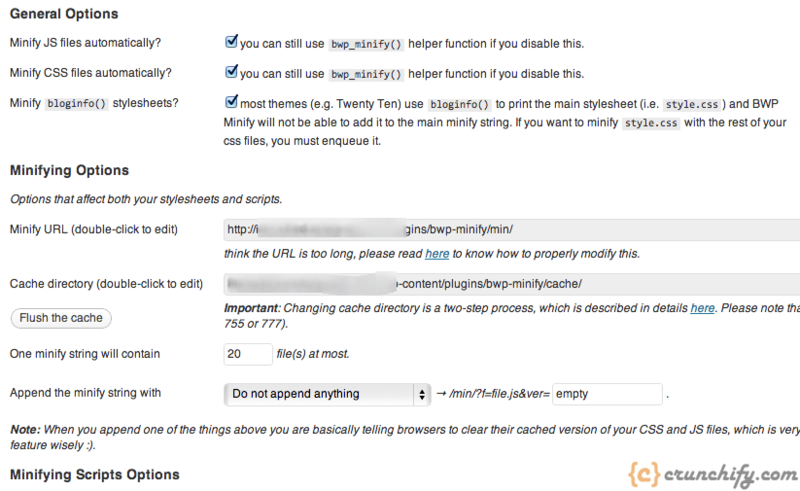 Better WordPress Minify was abandoned 3+ years ago, sadly. It will minify all HTML, inline CSS, inline JS, with several defined constants available to customize the functionality of the plugin as desired. Cheers, Crunchify! Agree. It’s not been updated since long time. I’ve updated post with more details. I’ll checkout MinifyHTML in few weeks and update. Thanks for sharing Jesse. I am using Better Minify WordPress plugin. I want to update my CSS file. Add some width and height into a class. But, when I update the CSS it is not affecting; because the site is using cached version. How do I update the cached version of my minified CSS by Better Minify Plugin? Hi Paul – there is an option available Flush the Cache. Just click that button and you will see new cached files. Just started using. Watching for errors. All looks good so far. Any issues with minify and discus? Thanks for your comment Jerod. Happy blogging. I just installed this plugin and it works wonders. However, it changed my website font style. Do you know how to rectify this? Hi Marius. Could you share your site URL? This happens because plugin may have modified your font URL and fonts may not be loaded in to header section of your blog. worked but only minifies my HTML. Didnt do anything with my css or js files. I have ticked it to minify css and js automatically. Hi Una – thanks for your feedback. Is there any special setting you could share with other readers? You tricked may help others. Does it have an option for minifying images? Thanks mate, it works on my site. Does this plugin work on a setting already running WP-Super cache and DB-cache reloaded ? Just a doubt of mine! Yup. It works with both cache plugins. I’ve tried and tested just now.